The BG375 trowel, and the WTS830 spreader wagon. The SVE/SVG screed is a lightweight complement to the manufacturer’s well-known heavy-duty BT90 modular screed. It can handle the 25-m-wide concrete pours needed in, for example, tunnel, road and exhibition hall construction. A single operator can assemble the screed without special tools. “Unlike the BT90, the SVE/SVG is made especially for medium to high slump concrete with less pulling resistance. Atlas Copco has designed the SVE/SVG to be lighter and more mobile, which in turn makes production more effective in the right conditions,” says a spokesman for the European company. 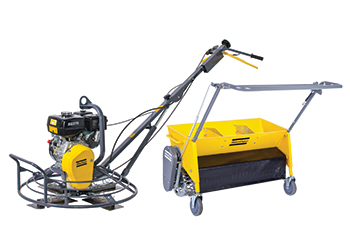 The modular screed can be equipped with both a fuel engine and an electric motor and is 100 per cent compatible with older and still popular Tremix truss screeds that have been part of the Atlas Copco Group for quite some time. The company’s new walk-behind BG-series trowel range can be fine-tuned to the operator’s needs and are safer than ever before. The new series includes BG245 E/G, BG375 G, BG475 G and BG Combi E with fuel and electric propulsion. New for the series is the centrifugal clutch available for every model with a fuel engine. The centrifugal clutch is a complement to the well-known Quickstop solution and it is a popular choice with many customers. “Atlas Copco’s centrifugal clutch is probably the safest on the market to date. It is a proven solution that engages if the operator lets go of the handle by mistake or accident. This safe centrifugal clutch is guaranteed to stop the trowel within the 180- to 200-degree range, well before the handle completes a full turn. It is also well within the new CE2015 standards,” says the spokesman. All new trowel models have additional safety updates. The belt cover is fitted with a secure tightening technique that means the operator can’t access the belt by mistake, while the blade guard rings have gone through further development to make operation even safer. “The BG375 and BG475 trowels are high-capacity machines for demanding industrial floors. 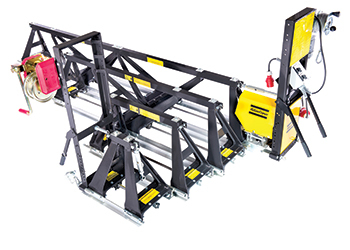 They are available with foldable handles in a short and long version to suit every application and operator. Handles come with vibration reduction, which means less risk of hand/arm injuries. The BG245 trowel is made for smaller areas but carries all safety features of the larger models,” the spokesman explains. Meanwhile, turning to the new spreader wagon, the spokesman says the WTS830 is a new hand-pushed wheeled topper spreader that helps create a perfect finish and can add colour to the concrete slab. It is lighter than other comparable spreader wagons and has a mesh drum that anchors the topping to the slab and reduces dust during operation. The spreader wagon is easy to push and is safe for indoor work as it does not produce engine exhaust fumes. Founded in 1873 and based in Stockholm, Sweden, Atlas Copco is a world-leading provider of sustainable productivity solutions. It develops innovative compressors, vacuum solutions and air treatment systems, construction and mining equipment, power tools and assembly systems. It has a global reach spanning more than 180 countries. Atlas Copco Construction Tools is a division within Atlas Copco’s construction technique business area. It develops, manufactures and markets hydraulic, pneumatic, and petrol-driven equipment for demolition, recycling, compaction, rock drilling and concrete applications. The division is headquartered in Essen, Germany, and has production units in Europe, Africa and Asia.